'6 Barrett Place' Rosemary Beach Luxury Condo with Magnificent Balcony + FREE BIKES! Perfectly Located RMB Vacation Rental with Huge Private Balcony + BIKES + 4 POOLS! Join our FREE Newsletter email today to receive updates about the latest rentals and specials on 30A. Enter your Dates and CLICK "INSTANT QUOTE" to Book Today! Interested in a unique Rosemary Beach experience? Come enjoy one of the premier properties located in the heart of Barrett Square, where everything is a short walk from your condo: white sand beach, 4 pools, shops, restaurants, local coffee shop, spa, fitness center, tennis courts, and a Parking Garage for your convenience! . The layout of this home draws you immediately through the open concept living/dining area towards the one-of- a- kind private rooftop terrace which is perfect for entertaining! 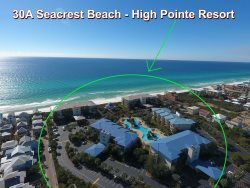 This is the largest outdoor condo space offered at Rosemary Beach, whether beach side or park side. This fabulous terrace consists of 3 separate living spaces (dining area, sectional sofa seating & chaise lounges), soothing fountains, palm trees, ice maker and true ambience - imagine being able to watch both sunrises in the east and sunsets in the west from the comforts of your own home. At night, the terrace is even more spectacular with perfectly placed outdoor lighting to set the mood for an evening under the stars! While inside, enjoy all the high-end features in a professionally decorated and relaxed setting. A fabulous, upscale chef’s kitchen complete with marble counter tops and Viking appliances is perfect for preparing a gourmet meal or snack before hitting the beach. For your convenience, a high end efficiency washer & dryer are provided. Just off the kitchen and past the breakfast bar (with seating for 5) is the elegant dining room with seating for 6. The open concept continues into the living room with plenty of seating for all your guests with a unique sectional, side chairs and a large, flat screen TV. The Master Bedroom is flooded with light from the large window and French doors leading to the rooftop balcony. This bedroom features a luxurious king bed, flat screen TV, and his & hers closets. The spacious master bath will remind you of a 5 star spa with a state-of-the-art walk in shower with a “rain” style shower head, 3 side jets, and hand held shower-head, all Grohe fixtures. The Queen Bedroom also has a French door leading to the balcony, luxurious linens, flat screen TV, large closet, and is connected to a stylish bathroom with a shower/tub combination. The beautifully appointed third bedroom features Twin Beds, flat screen TV, a unique barn style entry door, and shares the bathroom with the Queen Bedroom. Secured building access, including elevator, designated underground parking spot, Wi-Fi & weekly Farmer’s Market just outside your door in the green spaces of Barrett Square. 1) We do not offer Travel Protection Insurance in our quotes. You may obtain one independently. 2) VERY IMPORTANT - WE DO NOT ACCEPT WIRE TRANSFERS. We accept Visa, MasterCard and AMEX only. 3) 3 bikes are included in the rental. To utilize, waiver must be signed and received before code provided. 4) CONSTRUCTION IS IN PLACE ALL OVER 30A. We cannot be held responsible for construction near the home. Northwest Florida Beaches International Airport is only about 20 minutes from 30A so getting here is easy! instead of the domestic admin fee shown at the time of booking. Josh was great and got us all the information we needed for our rental in perfect timing! We will be back for many future vacations! Best rental experience I have had in Florida, thank you 30aescapes. Loved the property and its location to beach, eateries and shopping! Our family loved staying here. The location was outstanding with quick access to restaurants and shops as well as a 5 minute walk to the beach. The condo was beautifully decorated and very comfortable. The rooftop patio is one of a kind! We enjoyed breakfast each morning and the starry nights on the patio. Highly recommend this rental. Easy to check in and out. Rental was in great condition and staff very friendly. The condo was immaculately decorated and maintained. The back patio was gorgeous and a great place to hand out in the evening. I love being right in the middle of the Rosemary shops and restaurants. Access to the beach and pool was close and easy! Celia was awesome. Very prompt and responsive to every text/message. Bryan handled additional bike rentals with ease.